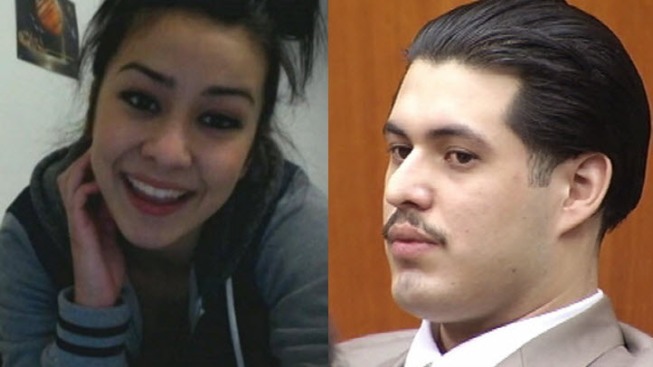 Sierra LaMar and her accused killer Antolin Garcia Torres. Defense attorneys for the man accused of the murdering 15-year-old Morgan Hill girl called two witnesses to the stand in a San Jose courtroom Monday morning, questioning them about their contacts with Sierra LaMar and Antolin Garcia Torres in the weeks leading up to the girl's disappearance. Garcia Torres, 26, has been in custody since May 21, 2012 for the murder of Sierra LaMar, who disappeared two months earlier. Her body has never been found. Marcelo Palmieri, who teaches Spanish at Washington High School in Fremont, testified that he had taught Sierra in September and October 2011, before she moved to Morgan Hill and transferred schools. Defense attorney Al Lopez focused his questioning on Palmieri's claim to law enforcement on March 21, 2012 that Sierra had visited his class "a few weeks" prior. Sierra stopped by to visit a friend for about five minutes between class periods either before or after lunch, Palmieri said. Palmieri named three girls who she could have been visiting but was unable to remember which one it was. But, he said, "I am 100 percent sure that it was Sierra LaMar in front of my eyes," Palmieri said. Prosecutor David Boyd suggested that by "a few" Palmieri had meant three or four, which would place Sierra's visit during her new school's ski week, between Feb. 20 and Feb. 24, 2012. But Palmieri insisted that Sierra had visited two weeks before, agreeing with Lopez that it was likely between March 5 and March 9, 2012. The defense has repeatedly introduced Sierra running away as an alternative explanation of her whereabouts. Earlier in the trial, some of Sierra's friends from Fremont attested to her unhappiness about moving to Morgan Hill, but doubted that she would run away. A second witness, Jeannette Kinner, testified Monday about her peripheral connection to Garcia Torres. Kinner said that she had only seen Garcia Torres once since graduating from Central High School in 2010, sometime between late February and early March of 2012. As part of her 21st birthday celebration, Kinner went with some girlfriends to the home of Maria Garcia, Garcia Torres' best friend, to buy a marijuana edible, she said. Kinner said that she stayed in the car and only saw Garcia Torres briefly when he was outside of the house. Kinner testified that she had never seen any of her friends interact with Garcia Torres. Boyd also questioned Kinner about her connections with friends closer to Sierra's age, seemingly to thwart any speculation by the defense that, through several degrees of mutual acquaintances, Sierra and Garcia Torres could have known each other or come into contact at some point. Kinner confirmed that, though she knew at least one girl who had gone to school with Sierra, she was not aware of this until after the disappearance. The trial is set to resume on Tuesday afternoon.